All SafeTech alarm monitoring clients are monitored by our 24 hour monitoring partner. Our security alarm monitoring partner has 7 central stations throughout Canada and the United States, allowing SafeTech to monitor any premises located in North America. Trust our alarm monitoring system services to keep you safe and protect your property. Providing service for nearly 25 years, our central alarm monitoring station is a fully redundant state of the art U.L.C listed central monitoring station.The main central alarm monitoring system station is located in Greater Toronto Area, the heart of Canada’s most populated region. Our other central stations are located in North Americas most populated regions: Nova Scotia, British Columbia, Alberta, Manitoba, Arizona, Texas and Florida. SafeTech’s alarm monitoring services let you monitor your home security system or your commercial security system. Remote Video Monitoring Services gives central station operators real time visual and audio communication with the premise they are protecting. Station perators can remotely assist, responding authorities while they investigate . A large percentage of triggered alarm signals are ultimately deemed to be false alarms. Police associations across Canada are very vocal about the burden false alarms place on their limited resources. Users of security systems are subject to rising fines for frequent or repeated false alarm activity. Excessive false alarms can even prevent the authorities from responding at all, leaving your business unsecured. Furthermore, many jurisdictions have implemented requirements for proof of security breaches (beyond the receipt of an alarm signal) prior to dispatching authorities. False alarms can also be an annoyance to your employees who must respond and investigate.With alarm monitoring system services and security cameras, you have access to video verification services. 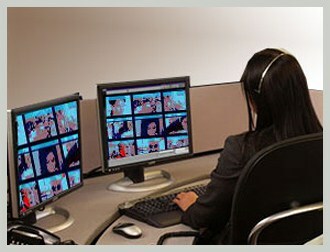 Video verification is a new service available through our alarm monitoring centres in Canada. When our alarm monitoring system operators receive an alarm signal from a video verification subscriber, they can immediately access recorded and live video to evaluate what is really happening at the affected location. Police are contacted only when the alarm activity has been determined to be a real security event. As a verified alarm, authorities will typically assign higher priority to the associated dispatch. Response is based on your pre-determined instructions. This can greatly improve the effectiveness of your alarm monitoring system service. When an alarm signal is received and verified by our alarm monitoring system center, the proper authorities are dispatched to your premises right away. In the case of a fire alarm, the fire department is notified. Should a break-in be detected, you may have either your local police department respond or a private guard company respond. Depending in what region you live in, police often have a registration fee and a false alarm charge. You may contact your local police,or SafeTech Alarms for the rates in your area. For a low monthly fee, you may choose to be registered with a private guard service rather than using the police to respond to alarm monitoring calls. In busy metropolitan areas, like Toronto, this may be a good choice. Most private guard service companies offer four free alarm dispatches per year where as the Toronto Police charge $80.00 per false alarm dispatch. In the case of Security Guards, all security officers are properly trained and fully equipped to handle any situation. Once the police or guards arrive, they will conduct a perimeter check of your premises, looking for any visible signs of forced entry. If a break-in has occurred, the police or guards will notify the station, who will report their findings to you. 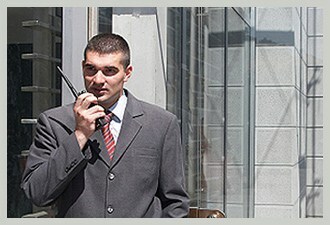 Pairing security guard services with alarm monitoring system services provides superior protection. Guards can respond to alarm monitoring calls to provide immediate help. Securing family and guests at weddings. Securing crowd control at concerts. Keeping the peace on a picket line. Watching over a construction project. Securing entire buildings and parking lots and even chaperoning individuals to and from a special event. There is no substitute for the physical presence of a security guard.